Panalee Village. This village was completed in 2014 with just a small amount of houses. This makes the village nice and peaceful and not too far across Sukhumvit Road in Huay Yai district. Huay Yai has direct routes into Pattaya or Jomtien plus there are 3 large Hypermarkets (Makro, Tesco Lotus & Big C) along Sukhumvit road. Huay Yai road joins Highway 36 to the East to Sukhumvit and finally Jomtien beach to the West. 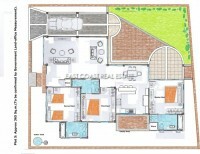 This great villa has a 3 bedroom, 2 bathroom layout. The home has a fully fitted kitchen, 2 air conditioners and a private swimming pool. The land size is 119sq.wah (476sq.metres) and the overall home is roughly 180sq.metres. The village has 24 hour security, a club house and a communal swimming pool. Ready to move, with title deed held in a Thai name. Tax and transfer fees will be split 50/50 between buyer and seller.